On this page you can find all the unbeatable epiLate initiatives that you deserve the scepter of #bestofepiLate! Why? The success of these initiatives is now well-known and you can not miss it. 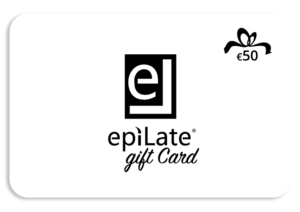 From the good friend to the many card values, with the “best of epiLate” you can take advantage of the most profitable initiatives that the franchise of experts in the final epilation makes you available to make you experience all of its unmissable and effective treatments and the exclusive high cosmetic line. Saving with epilates is also assured for facial and body treatments! The exclusive seat-saving packages, in fact, are also available for BodyCare and FaceCare treatments and the advantage is absolutely unmissable. Find out how much you can save! Prepaid cards are prepaid to take advantage of exclusive epiLate services and to use on the purchase of the creme line with a real added value. 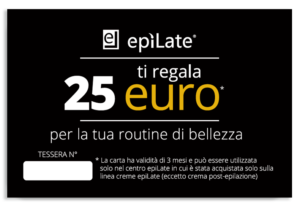 With the purchase of the prepaid card, you will immediately receive a further 10 or 25 euro worth card worthy of the epiLate high cosmetic line! What are you waiting for? Availability is limited! Available only epiLate center where it was purchased, invalid on packets. Available use epiLate center where it was purchased within 6 months of purchase only on epiLate creams except post-epilation. Available epiLate centers where it was purchased, not valid on packages. Have you become our customer? You can finally take advantage of the opportunity that epiLate has reserved for you: the good friend! For any friend who will be present on your behalf for final treatment, you will both have the right to a seat on a regular complimentary area after the first payer. You have a lot of friends? You can use the good friend with all of them and make sure you really save money. What are you waiting for? Shake your voice and start saving! If a new customer appears at your own center in your name to perform the epilation treatment, for both, the second free seat on a regular area.